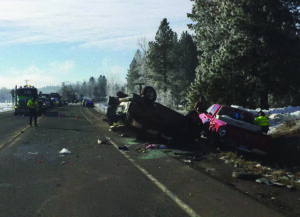 Monday was a busy day for police and a bad day for motorists on Highway 95, which was hit with back-to-back car wrecks. The first car wreck on Highway 95. Courtesy Sandpoint Police. The first occurred Monday morning, involving three vehicles and one logging truck near Fry Creek Vet Clinic and Sherwoods Road. Traffic was blocked as emergency crews cleaned up the wreckage. Hours later, the highway was closed again when a second two-car accident occurred at nearly the same location. By 3:17 p.m., crews had the new damage cleaned up. The incidents had some social media users vowing to request a speed reduction in the area from Idaho Transportation Department.